WIPWednesday 1-11-17 — Knit'n Kitten Fiber Arts, Inc.
Work on the shop table runner and sherbet handspun poncho goes on, but finishing the tree skirt (photos on Friday) means that progress isn't very visible. That being the case, I'd like to introduce my "purse-pocket penguin". Purse-pocket penguin in newest purse lining. 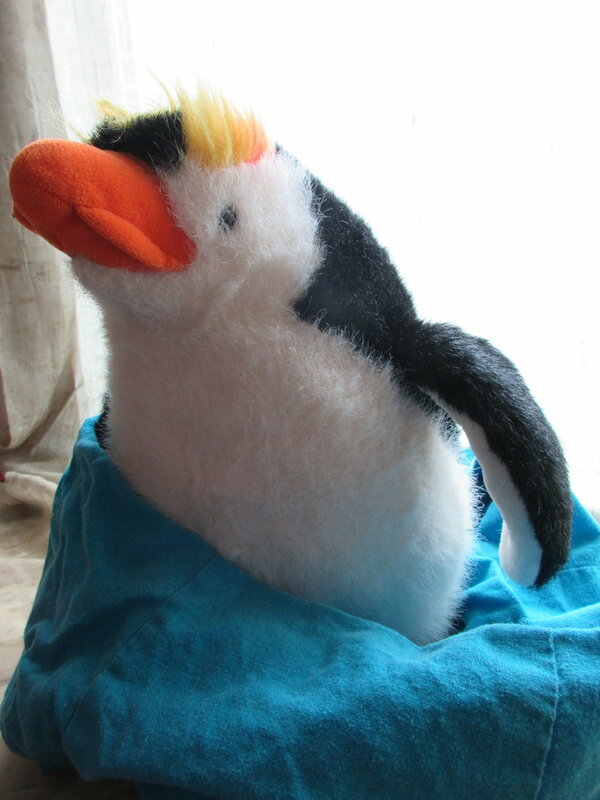 Sadly, even though this penguin is about 20 years old, has lived in 4 states and was a gift from my late husband, it has no other name and Purse-Pocket Penguin is recent and more of a job title than a name. When I reuse a shirt for lining a bag I seam the armholes closed and then stitch the sleeves upwards to form pockets. In doing so I need *something* to keep from sewing opposite bits together and the penguin ended up being the perfect size and shape for the job.